So, Saturday was the last night of the run and Sunday was going to be the first proper home-cooked dinner she’d had in a little while. I had been pondering what to make for that particular meal when Paul from The Well Hung Meat Company called. I buy most of my meat from them, and get a meat box every month or so. He said they had some veal in, and would I be interested. Of course I would be interested! And when he mentioned that they had some osso bucco, I was sold. 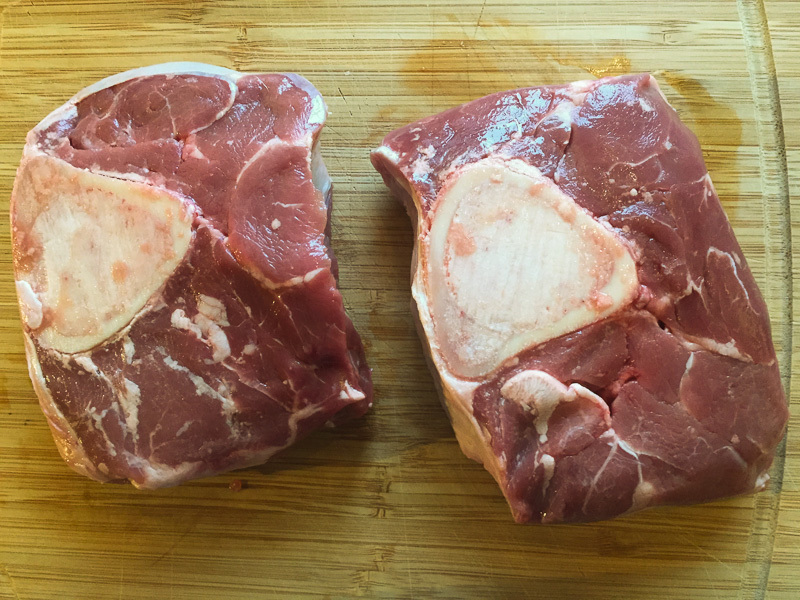 So, a few days later, a mixed veal box arrived, which included some osso bucco – thick slices of veal shins. Sunday dinner was sorted. Now, I’ve never actually cooked Osso Bucco before, so I was very interested in seeing how it turned out. The Prawn Cocktail Years recipe describes it as “one of the finest dishes in the world”. Well, that’s a bold statement. Let’s see. 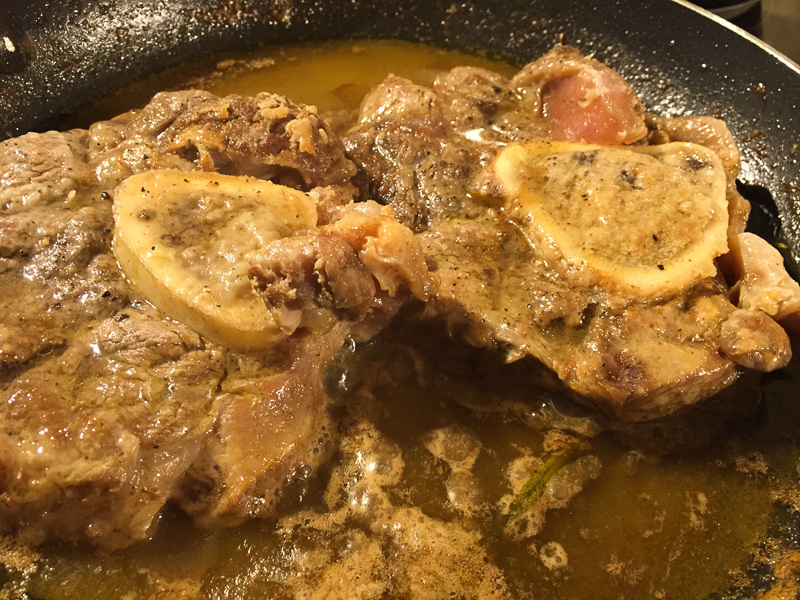 Osso Bucco, it turns out, is surprisingly easy to make. The version here is the older, more traditional, in bianco, rather than the more modern version which uses tomatoes. 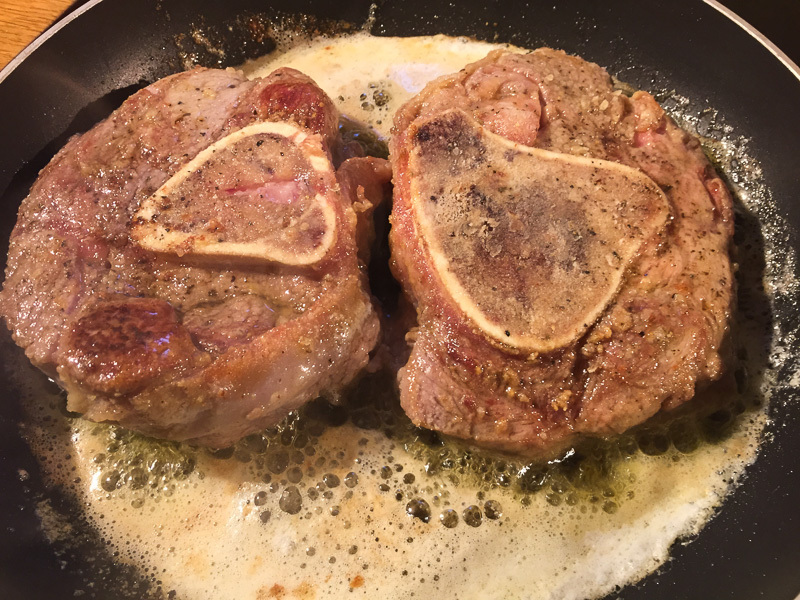 You start by seasoning the veal shanks, dipping them in flour, and then frying them in butter and oil until they start to brown. Then, add white wine, cover the pan and turn down the heat, and leave to braise for half an hour or so. 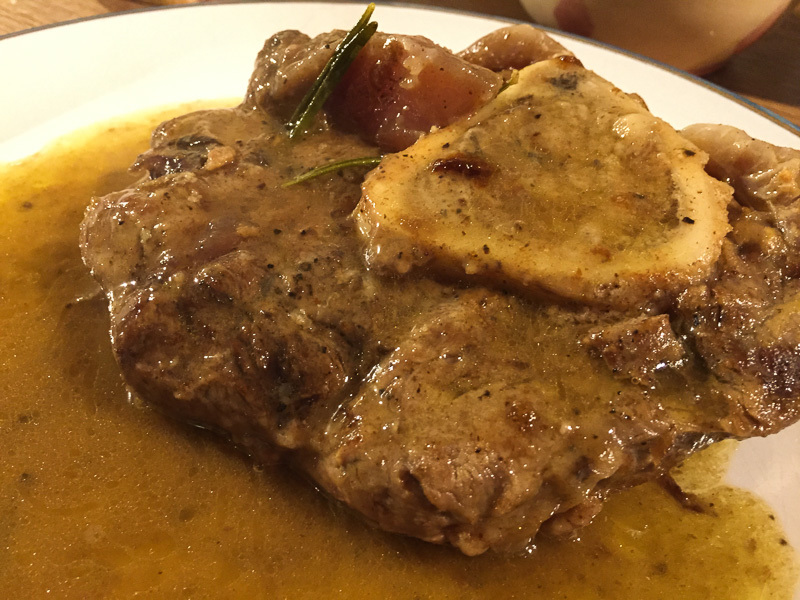 Once the wine has reduced somewhat, turn the veal over, add more wine, lemon juice and a sprig of rosemary, and leave to braise further, topping up the wine if it reduces too far. I served with mashed potatoes, green beans, and a tomato and basil focaccia. I wouldn’t go so far as to describe it as one of the finest dishes in the world, but it was certainly very nice. The acidic bite of the sauce worked particularly well with the soft and tender meat. All, in all, not bad. I would definitely cook this again. My first proper cooked dinner that has been eaten at a table since before the play Abigail’s Party began on 18th of March. (Well, we had last Sunday off, but it’s still a long run of microwave reheating, sandwiches and midnight suppers). I don’t think I’ve had Osso Bucco before, but it was delicious. From the look of the sauce on the meat and plate I expected buttery, but was pleasantly surprised by the sharp tang of white wine and lemon (with butter I’m sure). The rich meat seemed well teamed with this sharper sauce. The dish was made with slices of meat with a marrow bone running through them. I love marrow. But you don’t normally get much marrow in a standard bone. But this was substantially bigger than most bones (cross-section) and was full of quivering marrow, soft and creamy and full of goodness. I confess, I sucked that bone clean! Dave served this with mashed potato and green beans. And then, to be doubly impressive he added in a beautiful tomato focaccia to mop up the juices. A very impressive first dinner. I consider myself well fed tonight. Looks like an excellent example of O.B. 9/10 points.